…where a Terrible Towel might make an appearance! 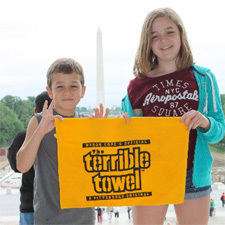 WITH their Terrible Towel! The two pose on the steps of the Lincoln Memorial with the Washington Monument in the background. According to their mother (and photographer), Bobbi Lyn, “Everyone watched the kids get their pictures taken. One guy even said, ‘That’s what I like to see!’ when he spotted the Terrible Towel! You can see another photo of Brady on his trip in the Lil’ Fans album. Have you ever seen a Terrible Wedding Towel? That’s what guests who attended the Guelph, Ontario wedding of Ken and Erin Moxam waved after the ceremony uniting the couple in matrimony! The wedding took place last weekend and the happy couple are on their honeymoon in Panama! The wedding colors? Black and Gold, of course! Congratulations to Ken and Erin!